Taiga.io is an open source project management system for agile developers, designers, and project managers. It's a beautiful project management tool that can handle both simple and complex projects for startups, software developers etc. The Taiga platform has three main components, and each component has its own dependencies. Taiga-back: Backend of the application that provides an API. Written in Python and Django. Taiga-front-dist: Taiga Frontend written in AngularJS and CoffeeScript. Taiga-events: Taiga WebSocket server to show real-time changes in the apps. And using RabbitMQ as a message broker. 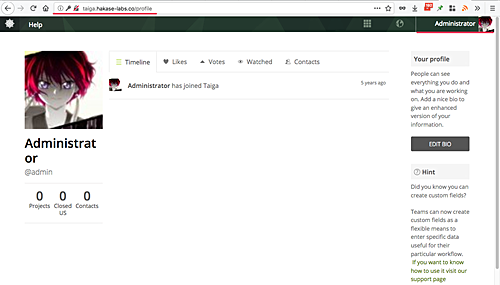 In this tutorial, I will show you step-by-step how to install the Taiga.io project management tools on the CentOS 7 server. We will also learn how setup and configure CentOS 7 server for Taiga.io installation. Before installing all of the Taiga.io components, we need to prepare the system by installing some packages. In this first step, we will install packages that needed for all Taiga components and modules, including Nginx, RabitMQ, Redis etc. We need 'Development Tools' for CentOS 7 that will be used for compiling some python modules. Install the required packages using the yum command below. Now we need to install the EPEL (Extra Packages for Enterprise Linux) repository. It's needed for installing the Nginx web server, RabbitMQ and Redis. Taiga.io needs Python 3.5 for installation. We will be using a third party repository - 'ius community' - to install Python 3.5. Add the 'ius community' repository in the following way. Now install Python 3.5 using the following yum command. 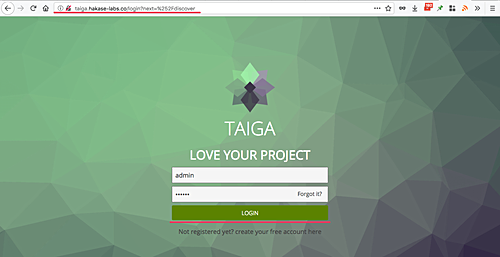 Taiga.io is a web application tool, and it's running under the web server. And for this guide, we will be using Nginx as the web server. Install Nginx from EPEL repository using the yum command below. Now check the open port using the netstat command. And make sure you get the HTTP port 80 on the list as shown below. This is optional, as you can still run Taiga.io without these packages. Basically, the Redis and RabbitMQ packages will be used by taiga-events. Install Redis and RabbitMQ from the EPEL repository using the yum command below. If the installation is complete, start both Redis and RabbitMQ services, then enable them to launch at system boot. Next, we need to create a new user and virtual host named 'taiga' for the RabbitMQ, and it will be used for 'taiga-events'. Run the following commands for creating new user and vhost named 'taiga' with password 'aqwe123', then set the permission for the 'taiga' user. Node is needed by 'taiga-events' - add the nodejs nodesource repository and install it with the yum command. All basic packages that are needed for Taiga.io installation have been installed on the system. Taiga.io is a web application based on Python Django web framework, and it uses PostgreSQL as the database. We need PostgreSQL version 9.5 for Taiga.io installation. Add the PostgreSQL 9.5 repository to the system. Now install PostgreSQL 9.5 using the yum command below. After installation is complete, we need to initialize the PostgreSQL database. Now start the PostgreSQL service and enable it to launch everytime at system boot. Next, we must create a new database for Taiga.io installation. We need to create a new database and a user named 'taiga'. Login as the 'postgres' user. Now create new database and user for Taiga.io using the following commands. New PostgreSQL database for Taiga.io installation has been created. In this step, we will create a new system user and group named 'taiga', and then add it to the wheel group for sudo command access. Use the 'useradd' command below to create the 'taiga' user and group. Now ad the 'taiga' user to the 'wheel' group. Test the 'taiga' user for sudo access. 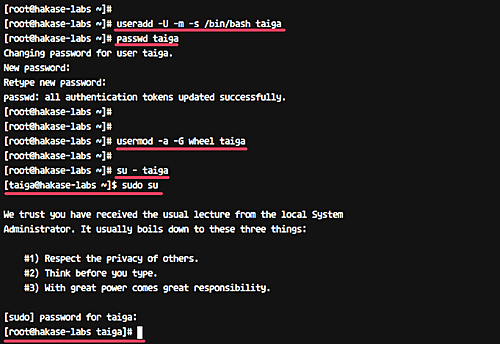 Type your password and make sure you get the root privileges for the 'taiga' user. Taiga-back is the backend of Taiga.io that provides an API to the Taiga frontend. It's written in Python and Django Web Framework. In this step, we will install and configure the taiga component 'taiga-back'. Login to the 'taiga' user and download the 'taiga-back' source code from GitHub. Now go to the 'taiga-back' directory and change the branch to the 'stable' branch. Before going any further, we need to update the virtualenv package. Next, create new python environment 'taiga' using the mkvirtualenv command. New virtualenv for 'taiga-back' has been created. Before installing all modules for taiga-back, we need to create a new link for the 'pg_config' command to the '/usr/bin' directory. 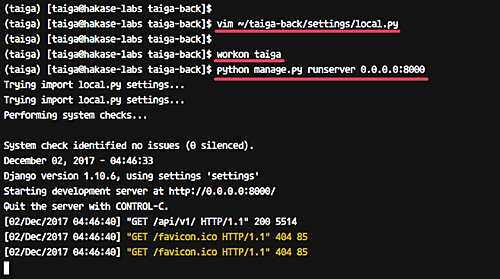 Now install all python modules that are needed by the 'taiga-back' using the commands below. After the installation is complete, we need to populate the database with initial basic data. Run all of the following commands. These commands will automatically create an administrator account 'admin' with password '123123'. Next, create a new configuration for 'taiga-back' using vim. Change the 'MEDIA_URL' and 'STATIC_URL' with your own domain name. Change the 'SECRET_KEY' with your own very secret key. Change the EVENTS_PUSH_BACKEND_OPTIONS password value to your own RabbitMQ value. For this guide, we are using password 'aqwe123'. Now test 'taiga-back' with the command below. The command will run taiga-back under the server public IP with port 8000. Open the web browser and visit the following address. And you will get the 'taiga-back' API with JSON format as below. The 'taiga-back' installation and configuration has been completed. In this step, we will download and configure the taiga frontend. The Frontend will handle all taiga interfaces. Login to the taiga user. Download the 'Taiga frontend' source code using git. Goto the 'taiga-front-dist' directory and change the branch to 'stable'. Copy default configuration file and edit it using vim. The 'Taiga frontend' configuration has been completed. Taiga-events is a WebSocket server that allows you to show real-time changes in the Taiga.io Dashboard, and it uses RabbitMQ as a message broker. In this step, we will download and configure 'taiga-events'. Login to the 'taiga' user. Download the 'Taiga Events' source code and go to the directory. Note: We need to install the 'coffee-script' under root system. Next, copy the JSON configuration file to 'config.json', then edit it using vim. Change the 'url' value with your own rabbitmq user and password. For the 'secret' value, make sure it matches with the 'SECRET_KEY' on 'local.py' - the configuration file of 'taiga-back'. Taiga-events configuration has been completed. Circus will be used for controlling and managing 'taiga-back' and 'taiga-events' process. 'taiga-events' is running as a coffee script, and 'taiga-back' is running under Gunicorn. In this step, we will install Circus manually from the source code. Login to as the taiga user. Now download the circus source code using git. Before installing circus on the system, we need to create a new directory for circus configuration. Create new 'conf' directory under the taiga user. And create new circus configuration for Taiga.io named 'taiga.ini'. 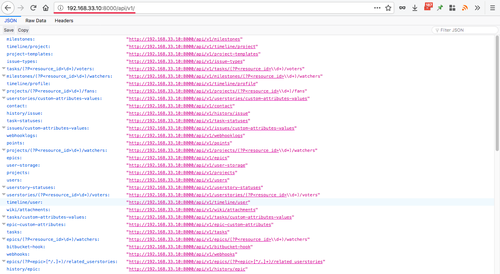 Now create the directory for circus log files. Go to the circus directory and install the software with root privileges. After the installation is complete, we will configure circus as a service on the system. Run the sudo command, then create a new service file 'circusd.service'. Now reload systemd system using command below. Make sure there is no error, then start the circusd service and enable it to launch everytime at system boot. Circus installation and configuration for Taiga.io has been completed. Check it using the circusctl command below. And make sure you get the taiga-back and taiga-events on the circus process list. Or you can use the systemctl command as below. In this step, we will configure the Nginx virtual host for Taiga.io. We will create a new virtual host file under the 'conf.d' directory for our Taiga.io installation. Go to the nginx configuration directory and create a new file 'taiga.conf' under the 'conf.d' directory. Now run the test nginx configuration and make sure there is no error. Then restart the web server service. The virtual host configuration for Taiga.io has been completed. Sometimes you may get an error about the Nginx web server saying it can't access taiga-frontend files - you'll see the Nginx '500 Internal Server Error' in this case. To solve this issue, we need to change the owner or group of all taiga-frontend files and give the Nginx access to all files. By default on CentOS 7, the Nginx web server is running under the 'nginx' user and the Taiga.io installation is running under the 'taiga' user. Following is the example of the Nginx error we're talking about. Nginx web server cannot read all content on the '/home/taiga/taiga-front-dist/dist' directory. Check this using the command below. And you will get the permission denied result. Now we need to add the 'nginx' user to the 'taiga' group and give nginx user required permissions for the taiga-front-dist directory. Add 'nginx' user to the 'taiga' group. Give the web server permissions to read all content on the taiga-front-dist directory. And restart the Nginx web server. And you should get the Taiga default home page a shown below. Here, type the default user 'admin' with password '123123', and then click on the 'Login' button. And you will get to the admin dashboard. Taiga.io installation on CentOS 7 with Nginx web server has been completed successfully. - restart the Nginx web server. Check the file /home/taiga/taiga-back/settings/local.py that you created, the indentation (whitespace) in front of the lines matters in python. Something happened and our Oompa Loompas are working on it. I'm installing on a RHEL 7 server vs. the guide's Centos 7 server, so maybe it's different but -- can anyone explain the reason for using a different python repo than whatever the standard one is? Does Centos just not have a good default python repo?